There is a lot of positive news to report in Summit County real estate. 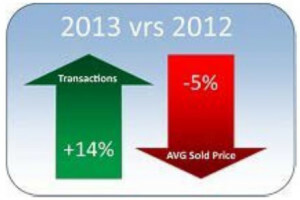 You’ll be happy to hear that 2013 came to a close with a 14 percent improvement in residential sales. Furthermore, 2013 was the fourth year in a row of double digit sales gains. Now that’s something to celebrate! In fact, since 2009 Summit County’s residential sales have grown 65 percent. It’s important to note, though, that sales would need to go up another 64 percent to reach 2006’s figures. However, the Summit County real estate market has made some amazing improvements over the last 4 years and the promising increases are not over yet. Unfortunately, sales prices have not been making as many leaps and bounds. In 2013, the average residential sale price went down about 5 percent. Still, there are some pockets of price improvement throughout real estate in Summit County. On the flip side, condominium sales have risen with a nearly 21 percent gain in 2013. This is a 78 percent increase from 2009’s numbers. Also, there’s a chance that condo sales will grow by another 91 percent to get up to the sales figures from 2005. In terms of single family home sales, the numbers ended on a flat note with a .2 percent gain for 2013. However, current sales figures are up 67 percent from 2009 and that’s a good thing. Plus, there’s the chance home sales will grow another 19 percent to reach 2006 levels. All in all, we can’t complain about the 2013 numbers. Little by little, we’re getting back to having a very healthy real estate market in Summit County! Market updates are always important to monitor. Just remember that real estate here in Summit County can change fast so be careful not to draw conclusions based on one report. If you’d like to view current listings on the Summit County real estate market, I can put together some properties that might meet your needs. Feel free to browse through the updated listings on my website as well. Then we can talk about the homes that interest you. Or if you want to put your own home on the market, I’m here to help you from start to finish. Whether you’re buying or selling, contact me at any time via email ([email protected]) or on my office line. I look forward to working with you!